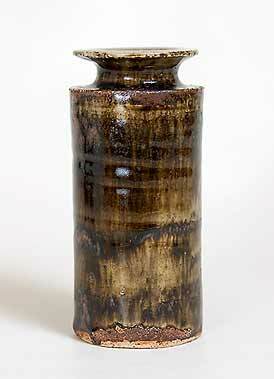 Derek Davis vase - 5" (127 mm) high, 2¼" (57 mm) diameter. Derek Davis was born in London in 1926. He studied at the Central School of Arts and Crafts in the last half of the 1940s and opened his own workshop in Buckinghamshire in 1953. Two years later he moved to Arundel in Sussex, where he has remained. In 1967 he was appointed Artist in Residence at the University of Sussex. Davis's work is always interesting. He has worked in earthenware, stoneware and porcelain, using various techniques - throwing, hand-building, press moulding and hand moulding. He quotes his influences as Picasso, Matisse and the American School. His later work is mainly sculptural and made as a commentary on his observations of life. He has been widely exhibited and is in the collection of the Victoria and Albert Museum.